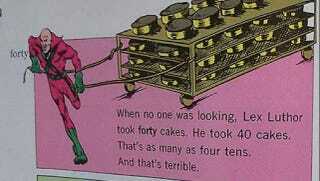 In a recent issue of Superman, it's revealed that Lex Luthor was reprimanded as a child for stealing 40 cakes. What you may not know is that the supervillain has had a long, terrible history of pastry larceny. In last week's Superman #709, we learn via flashback that a juvenile delinquent Lex Luthor once absconded with 40 cakes from a school bake sale. This was no mere throwaway line but a reference to a weird 1970s DC Comics children's book that graduated to internet meme. In the definition for "Enemy," Batgirl is awfully chipper about her impending demise. Lest you forgot, this is a children's book. This is another story arc we want to see on the Wonder Woman TV show. Similarly, this is a huge spoiler for Zack Snyder's Superman reboot. I've never agreed with a statement more. If only you knew, Black Canary. If only you knew. During the great DC writers' strike, Wonder Woman was forced to narrate her own comic. To an outside party, Hawkman and the Atom's foreplay is downright mystifying. Lex Luthor's great cake heist was consigned to obscurity for almost 30 years, until the internet resurrected it as a full-blown meme circa 2005, prompting such imaginative graphics as this poster by TheOtherJeff. So there you have it — Superman's greatest foe's ganache addiction is now comic book canon. Oh internet, what can't you do? Scans via Krypto's Flickr, Artastic Avenjer, and Strange Visitations.